Blister, Rockin’, Top Shelf, Dan, Wandering Dot, and me. Ah! These last two days have been AWESOME! My first double zero and so worth it! I am staying at Rockin’s in Tehachapi and I’m with fellow hikers Blister, Wandering Dot, and Top Shelf. Thanks Rockin’ and Dan for welcoming us into your home and making this trail town one to remember. I felt like I was staying with family and that is priceless! I was even able to ichat with Rockin’s daughter who knows more about website codes. She helped me figure out how to fix the quality of the pictures I post from the trail. Thanks Emily! 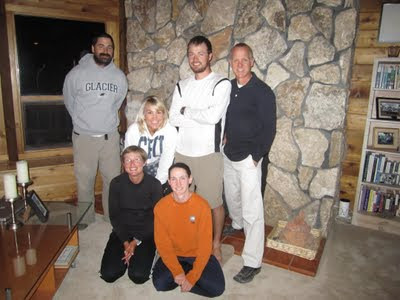 We spent the first zero day planning for the upcoming Sierras. We can’t believe it came so quick! I’ve mentioned this before, but this year on the PCT will be known in the record books for the insane amount of snow in the Sierras. It has been the talk of the trail for the first month. Our 25mi days will quickly change to very draining 15mi days through high elevation passes and deep snow while carrying the added weight of ice axes, microspikes, and a bear canister. Due to the snow and amount of time it will take, we all had to readjust our plans to include more resupply locations than we originally planned. We will hit the true Sierra section in about a week after Mile 700 (Kennedy Meadows). Most years, the recommended leave date from Kennedy Meadows to enter the Sierras is June 15th…our most recent schedule has us leaving June 11th…uh-oh…it will all depend on when the roads are opened so that we are able to receive our resupply boxes. 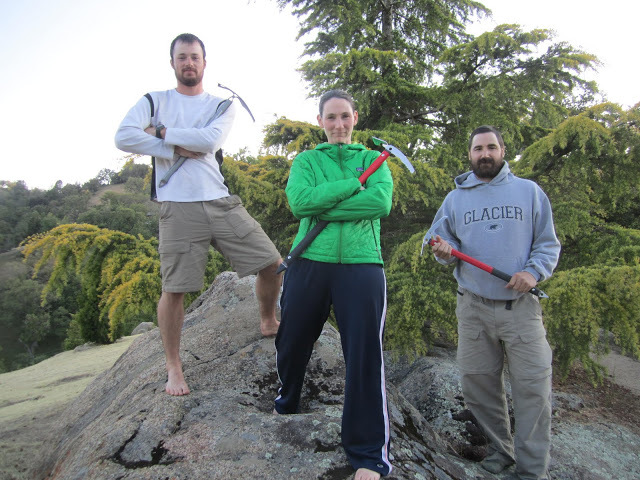 Let us know if you have any suggestions of a good team name for the three of us planning to tackle the Sierras together. I’ve mentioned Blister in my previous journals and actually met him for the first time on my fifth day on the trail (the same night I met Top Shelf). We’ve been leap frogging ever since and I’m excited that we’ll be doing the Sierras together. Blister is 36yrs old, married, and from Nebraska. He did the Appalachian Trail in 2006 and is an engineer off the trail. It is his mind for engineering that has him more “data” oriented on the trail. He has even developed his own application through his phone using Excel to physically map out the trail and show the various data elements (elevation, mileage, pace, distance of resupply locations/trail towns, weather, etc) along the whole trail. After a few hours of hiking in silence, it’s always entertaining to pick Blisters brain cause you never know what you’re gonna get and it’s sure to be a very entertaining rollercoaster of thoughts! Another thing I want to mention in this upcoming adventurous section is that Wired(my trail name) may become “unwired” because phone reception is very sporadic over the next month or so. I will still be writing posts daily and I will be sure to post them when I get a signal. I am getting my new SPOT locator in the next week, so I should have it reconnected to the site by the time we leave Kennedy Meadows.